Not worth its price and weight. For laptops, better to buy dedicated HP Spectre laptop portable chargers or Dell Notebook PowerBank available at same price. For AC power and niche DC use such as drones and photography equipment, Omnicharge Omni 20 is much better. For Macbooks, get a good 30 or 45-watt USB-C PD powerbank. On the good side, it offers the flexibility of theoretical 100 watt AC power, USB-C, and USB ports combinehttps://www.powerbankguide.com/best-usb-c-powerbanks/d with somewhat competitive price. Versatile home as well as outdoors, survival, emergency and camping use power bank. Works for many uses – big laptops, and AC equipment – where no other powerbank will be able to provide backup power. On the bad side, the efficiency in AC mode is very low, the quality is inconsistent, the powerbank is too heavy and too expensive. If you need to power Macbook Air/Pro, you are better off buying a 30-watt USB-C PD powerbank. If you really need AC power for some equipment or high power laptops, you are better off buying better Omnicharge Omni 20 for some extra price. For powering big laptops (Dell XPS 13, HP Spectre), better buy dedicated HP/Dell laptop portable chargers that are available at same price or buy a Omnicharge Omni 20. Suitable for charging emergency AC equipment for short periods of time. 100 Watt power output – Best in class. Run a huge variety of AC equipment ranging from LED TVs to printers, PC monitors, fans, CPAP machines etc. TSA approved. Can be carried on flights in carry-on/cabin baggage. Can be quickly charged in about 6 hours flat! USB type-C output – Run your latest laptops such as Macbook Pro directly! Heavy for the battery capacity provided. 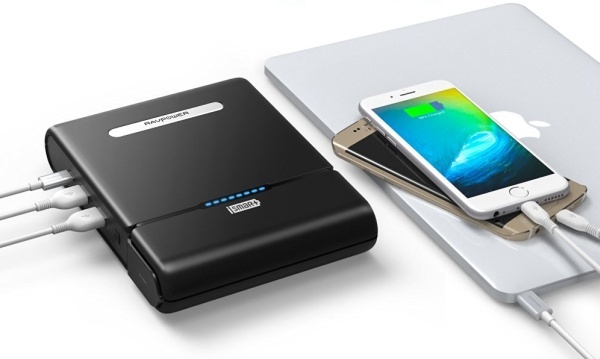 The RAVPower Universal Powerbank 27000 is a unique power bank that offers much more versatality and flexibility than a regular power bank. This feature-packed power bank opens a world of possibilities in portable power backup by enabling you to run AC electrical appliances with up to 100 watt of required power. This includes Macbook Pros, almost all types of laptops, fans, printers, christmas lights…the possibilities and uses are almost endless. What is more, it comes with USB type-C charging that allows you to run or charge the latest Macbook Pros or Chromebooks and ultrabooks from it directly. Running capable devices directly using USB-C is more efficient then running them using the AC adapter and allows you to maximize the powerbank’s run time. Additionally, it comes with two smart charging USB ports that deliver up to 2.4 Amp of power and automatically sense and adjust charging current. This allows you to charge smartphones and devices such as iPads at their charging speeds over twice as fast as usual charging ports. The 26,800 mAH capacity (nominal 2700 mAH) makes RAVPower Universal Powerbank 27000TSA-approved and flight-safe. 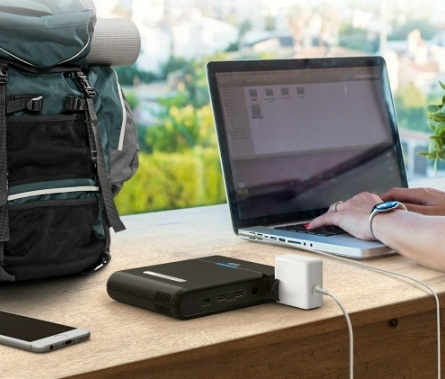 This allows you to take this powerbank with you in flights and power your Macbook Pros or laptops for entire flight. All this flexibility and battery capacity comes in a sturdy solidly built package that is priced competitively with other other comparable powerbanks. The AC outlet looks good on paper, but please be advised it is meant only for emergency use. Using the AC outlet, we could charge our 2017 Macbook Pro Just about 60%. Despite having a massive 26,800 mAH battery, the RAVPower Universal powerbank gets charged at blazing speed in about eight hours flat as it gets charged at an incredible 19 volts! this is even higher voltage than the QuickCharge 3.0 charging which charges at 12 volts. This makes RAVPower Universal powerbank, the fastest charging 26,800 mAH class external battery pack in the market and is a boon for travellers, business people, campers, survival enthusiasts and other professional users such as photographers. Two iSmart USB ports for charging smartphones at 2.4 Amps. The iSmart ports sense the required charging current of plugged device and deliver optimum current up to 2.4 amps. One USB-C output port for charging latest Macbooks and laptops. No USB-C Input is supported. One three-pronged AC outlet that can deliver up to 100 watts of AC power. The current delivered by AC outlet depends on the wattage used. For example, at 100 watt, the current output is 0.9 Amp. Some of the countless uses for the AC outlet include running printers, Christmas lights, audio-visual equipment, fans, lights, PAP machines etc. A huge variety of laptops, including Macbook Pros, can be charged through the AC outlet as most laptops draw about 60-100 watts of power. Please note that no direct DC output pins or ports for charging laptops are provided and laptops are charged by AC adapter. The AC outlet delivers 110 volt output (220 V for chargers sold in European union). The power bank has vents for cooling for handling the high power output capability of the power bank and this keeps temperatures to normal levels despite extended use. The eight blue indicator lights are very handy for battery-level indication. It can charge a Macbook, iPad and an iPhone at once! This monster power bank will charge a Macbook Air 2015 about 80% with the AC port and about twice with the USB-C port. It will charge an iPhone 7 more than 10 times, and a Samsung Galaxy 7 more than 7 times. 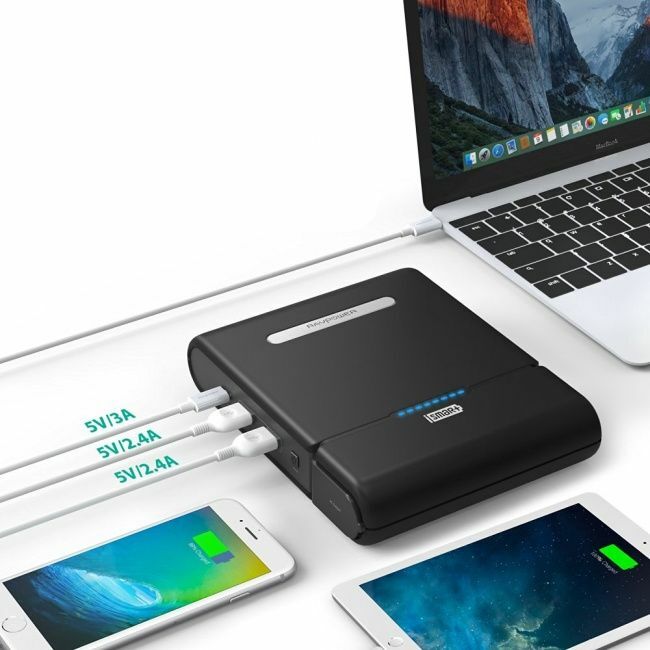 What is more, it can charge three devices simultaneously through the two iSmart and USB-C ports, allowing you to charge your Macbook Pro or Macbook Air, iPad, and iPhone at the same time! Please note that RAVPower Universal does not support Quickcharge 2.0 or 3.0 output, it will however charge Quickcharge compatible devices at 2.4 amp fast charging current. Chargetech ChargeAll 27000 is a direct competitor toRAVPower Universal Powerbank 27000 as both offer AC outlet with 27000 mAH capacity. Also, Chargetech ChargeAll 27000 gets charged in just 2.5 hours compared to 6 hours or so taken by RAVPower Universal Powerbank 27000. We think that both RAVPower Universal Powerbank 27000 and Chargetech ChargeAll 27000 are comparable to each other with RAVPower Universal offering the additional feature of an future-proof USB-C + greater 100W charging power. USB-C is quickly becoming the standard charging port of the future with latest devices such as Samsung Galaxy S8 and Nintendo Switch sporting it. Given its inconsistent quality, poor charging efficiency, inadequate power backup, high weight and somewhat steep price, we do not recommend RAVPower Universal Powerbank 27000. 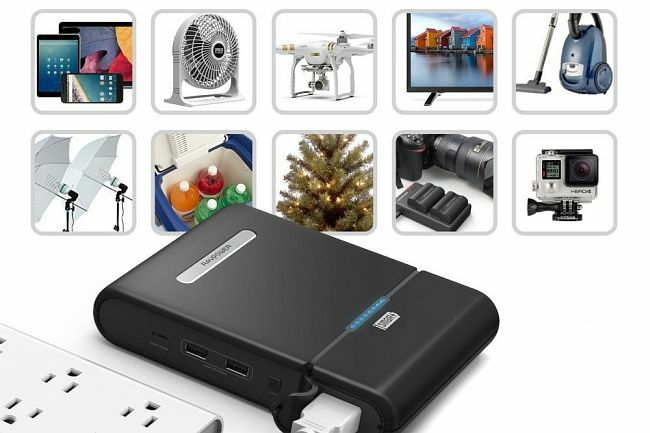 For professionals, avid travellers, survival, outdoor and camping enthusiasts and even regular home-owners who may need a handy AC outlet in the event of power cuts or while travelling or for emergency or remote use, we instead recommend Omnicharge Omni 20 AC outlet portable charger as it offers better quality and a high efficiency DC barrel port for charging laptops directly. If you are buying an AC outlet powerbank to power big screen HP/Dell laptops, (Dell XPS 13, 15 HP Spectre etc. ), it is better to buy dedicated HP/Dell laptop portable chargers that are available at same price. 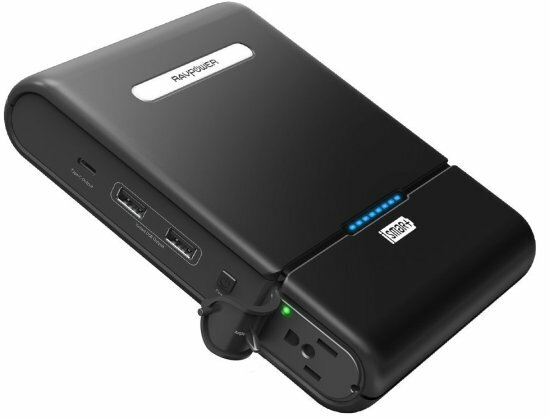 For big screen laptops of other brands, Omnicharge Omni 20 AC outlet portable charger is a better choice, though at a much higher price.